Have you ever wanted to know the best day of the week to buy groceries or go out to dinner? Have you ever wondered about the best time of day to send an email or ask for a raise? What about the best time of day to schedule a surgery or a haircut? What’s the best day of the week to avoid lines at the Louvre? What’s the best day of the month to make an offer on a house? What’s the best time of day to ask someone out on a date? You know what? I have wanted to know these things!! My book, Timing is Everything: A Guide to the Best Time to Buy This, Do That and Go There, has the answers to these questions and hundreds more. A beautiful relationship of useful questions and useful answers, quirky questions and funny answers, hundreds of questions and even more answers to everything I ever wanted to know it seemed. And the lovely Kate Nintzel at William Morrow joined our team and helped turn it into the New York Times bestseller BUY KETCHUP IN MAY AND FLY AT NOON: A Guide to the Best TIme to Buy This, Do That, and Go There. It was the best of the best. And Mark always said that was it. He’d culled the MOST interesting questions. The MOST important information. And we were done. But the masses spoke. They wanted more! They needed more timing tips!! And so I am pleased to say that Mark’s new book is filled with entirely new tips. Just like before, he backs up his information with fun facts, did you knows? and solid research. Change my oil?? Rotate my tires?? Wait, when should I buy a car??? Sorry, just go buy the book already. I mean, you don’t expect me to give away all the tips here, do you?? 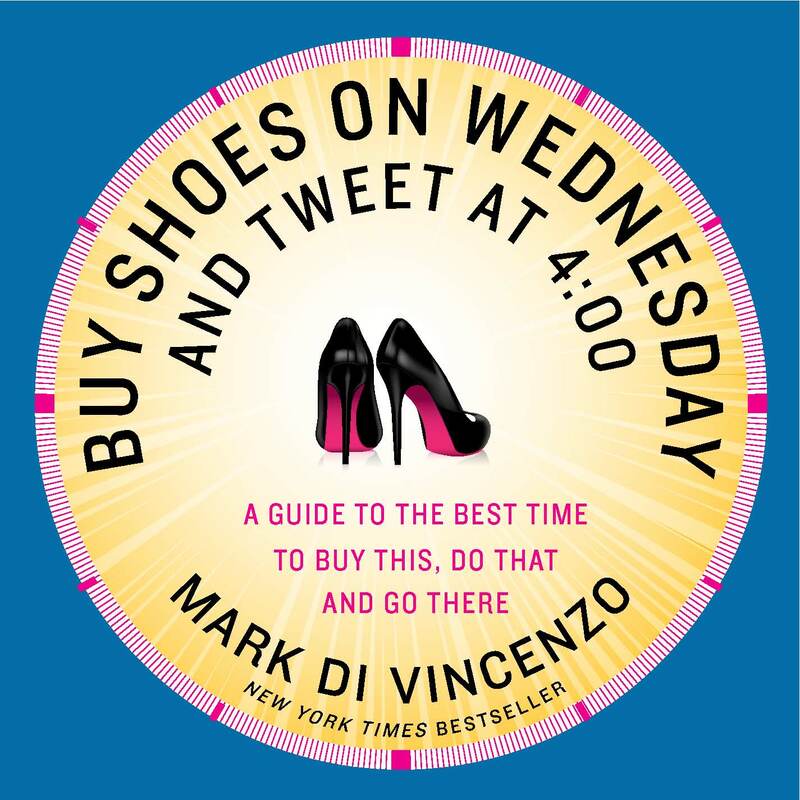 BUY SHOES ON WEDNESDAY AND TWEET AT 4 by Mark Di Vincenzo. Buy it now! At Amazon or Barnes and Noble. Plus, how awesome is that cover??? Go buy this awesome book right now!! Big Congrats to Mark!!!! You know what is cool… I’d actually heard of the first book. It’s very quotable! Thrilled another is on it’s way. Congrats on another winner to you too, Michelle. Sounds like a very useful book. I think I will pick myself up one in the near future! Sounds like a very useful book. Actually, I’ve heard of it. Think I’ll Tweet about it, but not until 4. Uh…is that a.m. or p.m., because I can do it at either. Maybe both.